After trying to get pregnant for a year without success, Steve and Melissa Weiss decided to see Dr. Lawrence Werlin of Coastal Fertility Medical Center in Irvine. Melissa Weiss’s reproductive organs seemed to be working fine, so “we went forward thinking it would be an easy case,” Weiss said. “It did not work out that way,” she said. Weiss, 39, discovered she is infertile. But her infertility remains undiagnosed. The doctors can’t figure out why she is infertile. STEVE MASLER, chief executive officer of FertilitySource Companies. 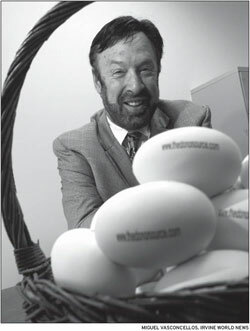 In the foreground are foam eggs the company uses as promotional tools. Wiess and her husband went through seven years of in-vetro fertilization, trying a combination of donor eggs with her husband’s sperm and her eggs with donor sperm. She managed to get pregnant once, but experienced a miscarriage at about 18 weeks. Then, an option presented itself in the most unlikely place – through her television. She saw Joan Lunden on “Good Morning America” talking about how she had chosen surrogacy, and suddenly that became on option for Weiss. “I thought wow, I need to do that,” Weiss said. That’s when she visited Irvine-based Donor Source. With Dr. Werlin’s help she found a surrogate and through the Donor Source she found an egg donor to use with her husband’s sperm. The latest figures, from 2002, show 12 percent of women ages 15-44 – or 7.3 million women – had a physical difficulty getting pregnant or carrying a baby to term. This represents an increase of about 2 percentage points from the levels seen in 1988 and 1995, according to a survey by the National Center for Health Statistics. But for those looking to have children, like Weiss, infertility is no longer the end of the road and the number of options and resources available continues to increase. While births by surrogate mothers remain a small fraction of assisted reproductive procedures, their numbers have increased sharply, doubling between 1997 and 2000 and reaching 548 in 2002, according to the Centers for Disease Control and Prevention as cited by The Washington Post. Responding to this increase, Irvinebased Donor Source International LLC has expanded its operations to offer surrogacy in addition to its egg donor services. The firm has changed its umbrella name to Fertility Source Companies and will operate under the names The Donor Source and The Surrogacy Source. The company currently has a comprehensive database of egg donors and is working to establish a similar data base for surrogates. California is considered “surrogacy friendly” because it has no laws limiting or prohibiting surrogacy, said Steve Masler, chief executive officer of Fertility Source. Unlike other states, California also has case law regarding surrogacy. In 1993 the California Supreme Court in Johnson v. Calvert, held that a gestational surrogate had no parental rights to a child born to her, affirming a lower court ruling that a gestational surrogacy contract was legal and enforceable. Gestational surrogacy is an option for women with viable eggs but for medical reasons cannot carry a baby. The embryo is created via In-Vitro Fertilization and transferred to the surrogate. A child that is born through gestational surrogacy carries the genes of both biological parents, not the surrogate’s. The Fertility Source will only focus on gestational surrogacy. There are many reasons why a woman may choose to be a surrogate, but one obvious reason is the financial aspect. Many surrogates are stay-at-home moms, who want to be able to bring in some extra income, said Jaime Williams senior case manager for the Surrogacy Source. Williams has worked in the field for the last five years before joining the Fertility Source this year. Fertility Source pays first-time surrogates $24,000 and egg donors $5,000-$7,500. A woman who has previously been a surrogate receives more and these women are usually preferred, Williams said. In order to be a surrogate a woman must already have at lease one child of her own. Surrogates also go through a criminal background check, a psychological evaluation and an in-home interview conducted by Williams, she said. During the in-home interview, Williams will take note of any social issues and explain the surrogacy process. For couples, the process can take anywhere from 15 months to two years, and incur a hefty price of about $100,000 – not including any clinical costs or attorney fees. Celebrities such as Angela Basset and Deidre Hall have also chosen the surrogacy route. “Now that people in the media talk about it glibly the physician and the patient is more comfortable with this choice,” he added. Magarelli said he sees about 35 to 40 new patients a month. About 30 percent of the couples he sees need third party reproduction. Of those, about 80 percent use egg donors and 20 percent use surrogacy, Magarelli said. Weiss is now preparing to welcome Lydia Maria, named after her grandmother and mother respectively, to her family in August. Weiss is rushing to prepare the baby’s room which will include pictures of her grandmother and of the surrogate, who has become like a family member, Weiss said. It is important that the couple and the surrogate remain in constant contact and attend support group meetings together, Williams of the Surrogacy Source said. The Fertility Source plans to continue expanding it third-party assisted reproduction services to include egg freezing next year. The company will keep a database of donors that have frozen their eggs. News researcher Colleen Robledo contributed to this report.